Chaos: When this card is flipped, banish this card, put a card from your discard pile on top of your deck, then flip that card. 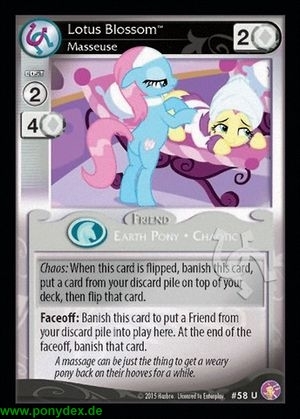 Faceoff: Banish this card to put a Friend from your discard pile into play here. At the end of the faceoff, banish that card. A massage can be just the thing to get a weary pony back on their hooves for a while.